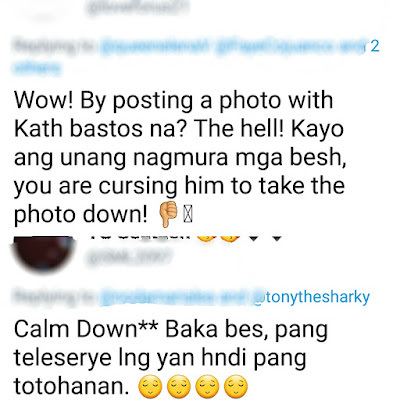 Tony Labrusca, who plays Jake in the top-rating Kathryn Bernardo-Daniel Padilla soap 'La Luna Sangre', has found himself in trouble with some KathNiel fans after he tweeted on Saturday evening a photo of him with Kathryn while on the set of their soap. The photo was actually first posted by Tony last June 15 on Instagram (@tony.labrusca), 4 days before 'La Luna Sangre' aired its pilot episode. 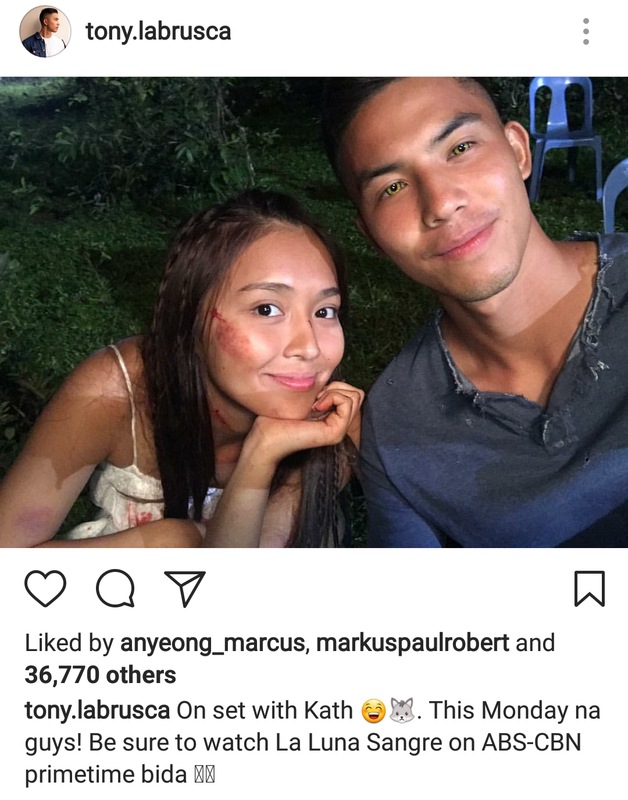 The newbie actor captioned the pic with this: "On set with Kath 😁🐺. 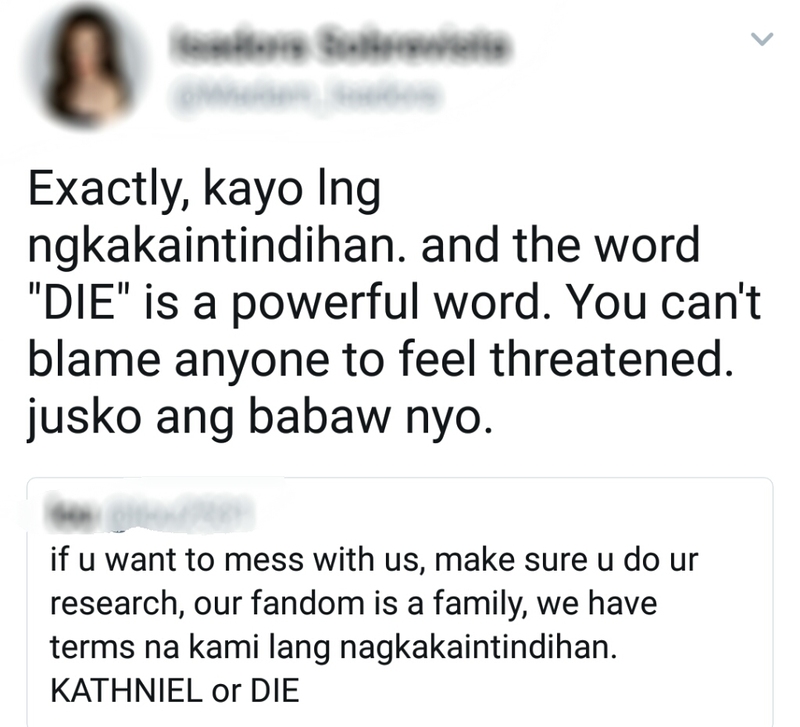 This Monday na guys! 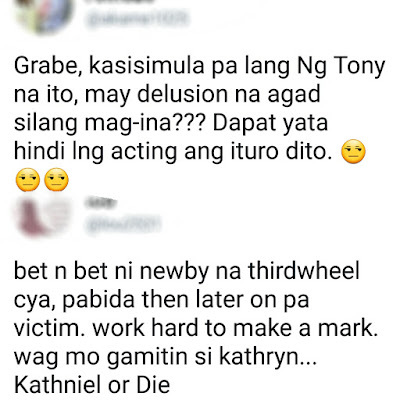 Be sure to watch La Luna Sangre on ABS-CBN primetime bida 🤘🏽"
I even re-posted that picture last June 27, as I praised Kathryn and Tony for doing a great job in their fight scene. @mykiru: "Good job Kathryn Bernardo and Tony Labrusca on that breathtaking fight scene! 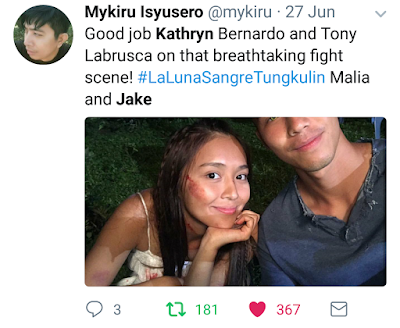 #LaLunaSangreTungkulin Malia and Jake"
Then just last Saturday, July 8, Tony posted that picture again on Twitter, but his caption didn't look good to some KathNiel fans. 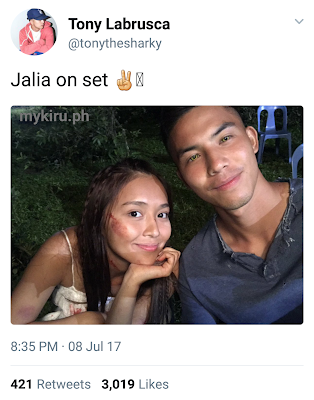 @tonythesharky: "Jalia on set ✌"
Tony put "Jalia", coined word for Jake and Malia, in the caption and even included the peace sign. 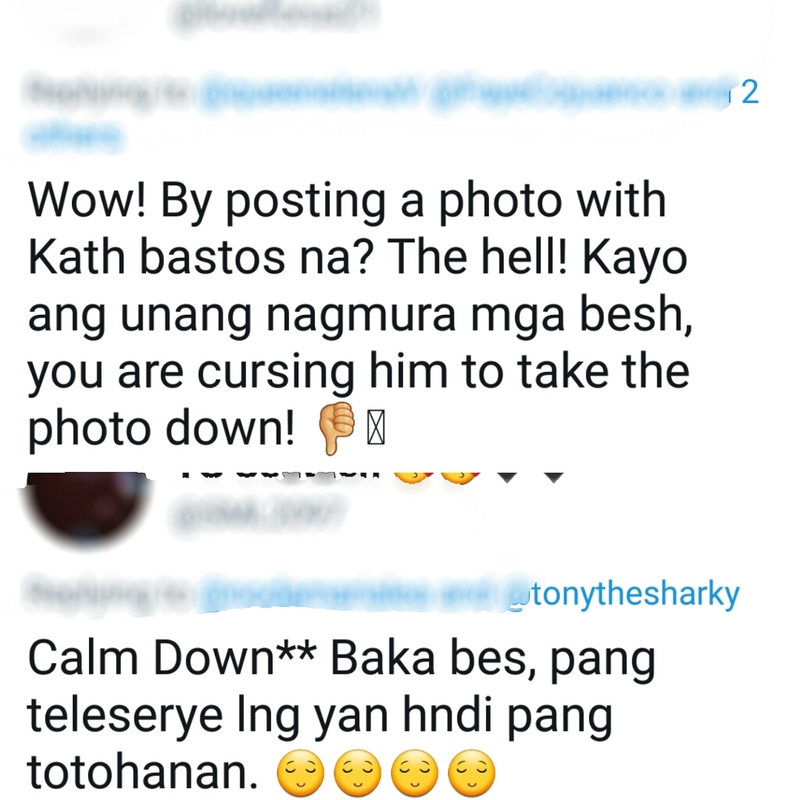 While I actually see nothing wrong with his photo (nothing romantic in nature) and with the tweet itself, some possessive fans interpreted it as Tony's self-proclamation of being or wanting to be in a loveteam with Kathryn, and they felt he's using Kath to be more popular. 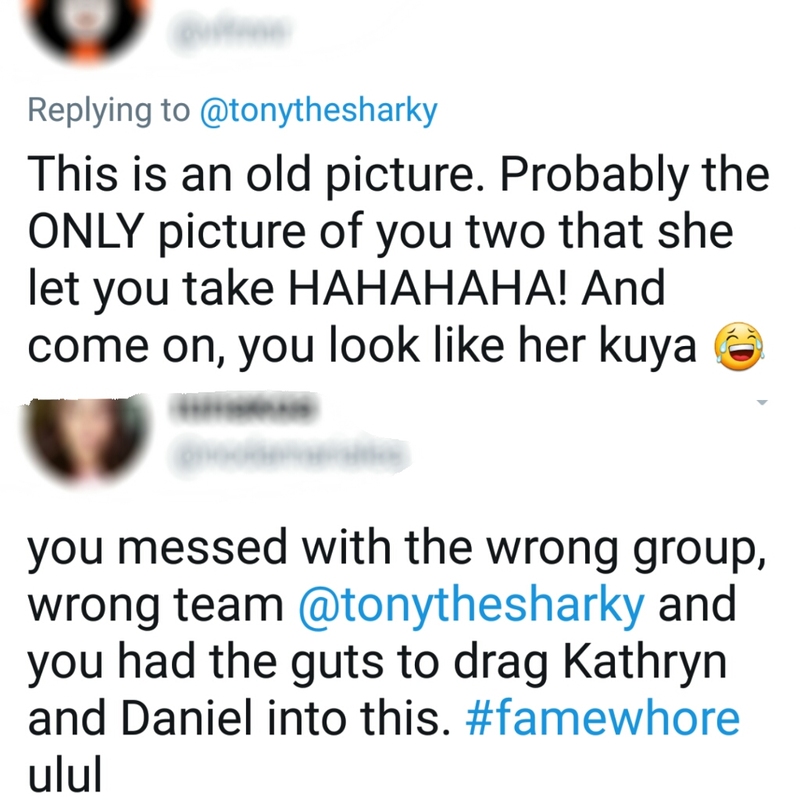 They even demanded Tony to take down the picture. 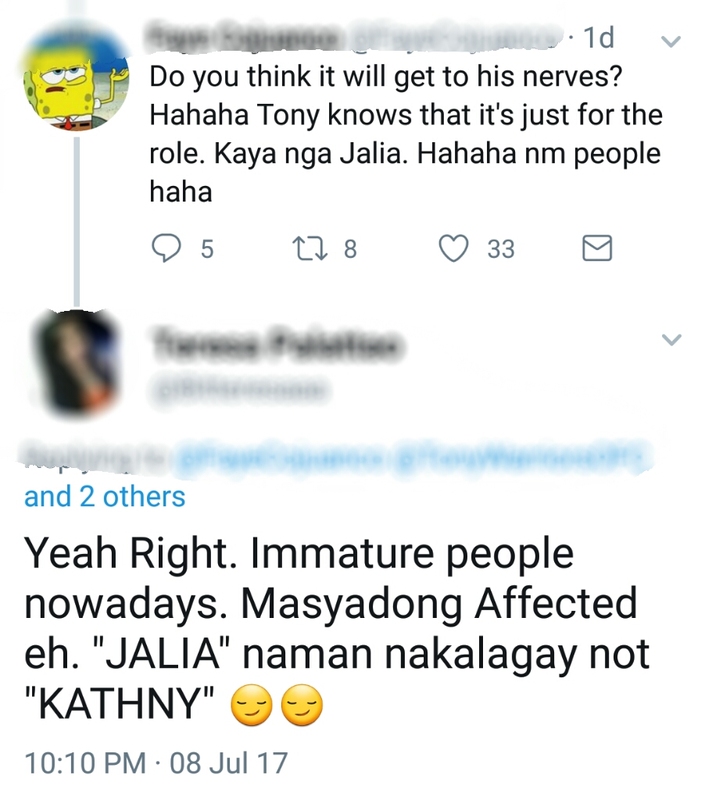 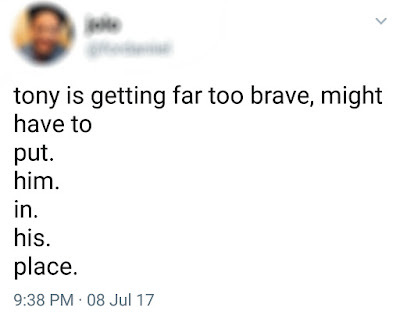 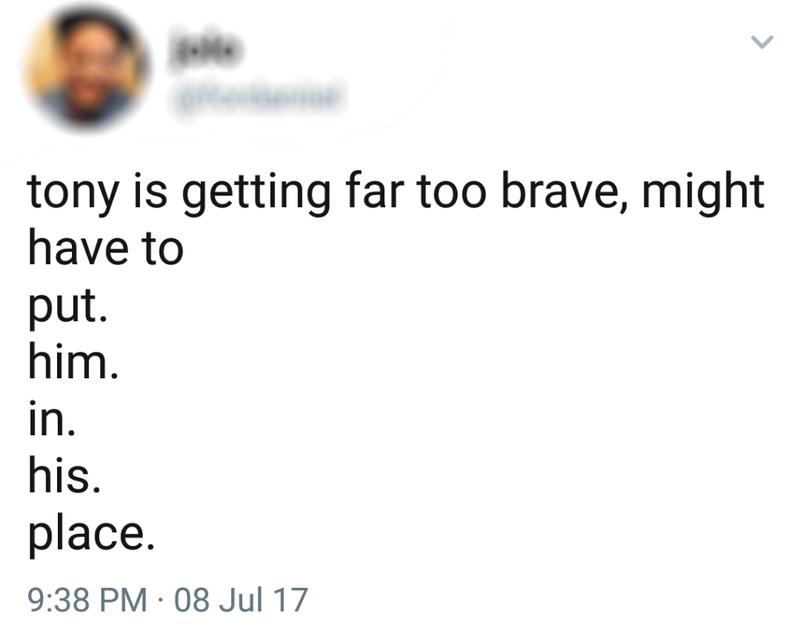 Others meanwhile have defended Tony. 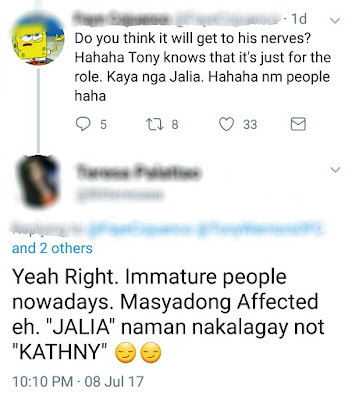 According to them, it's just their characters, and doesn't necessarily mean the actor is making it real with Kathryn. 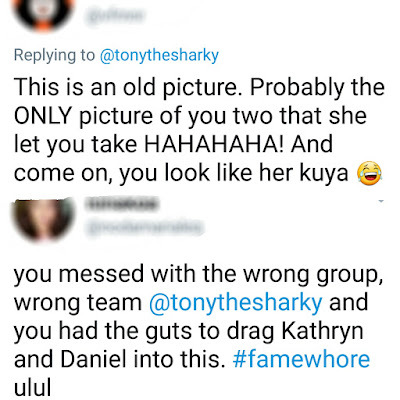 Tony, who admitted he knew beforehand that he might get bashed for being the 3rd wheel for DJ and Kath in LLS, later appealed to the fans via Facebook to stop cyberbullying. 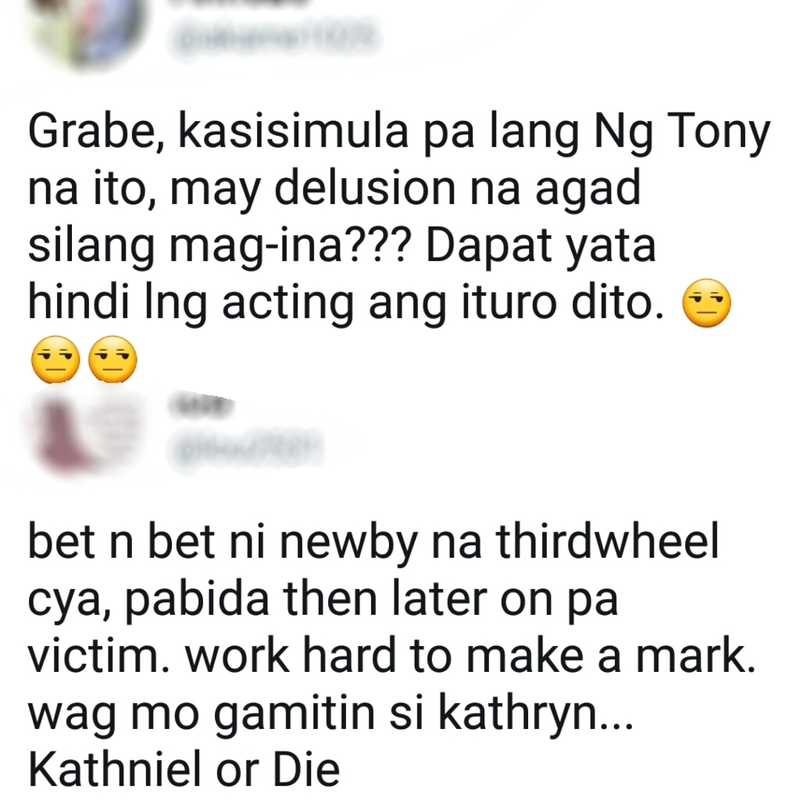 Sad for what happened to Tony. 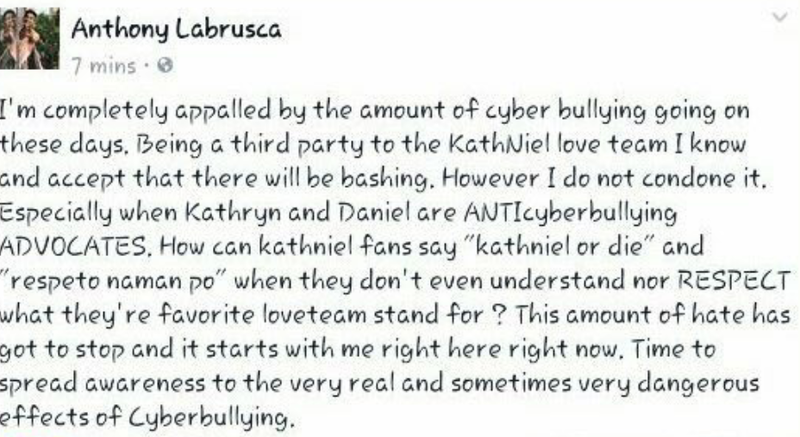 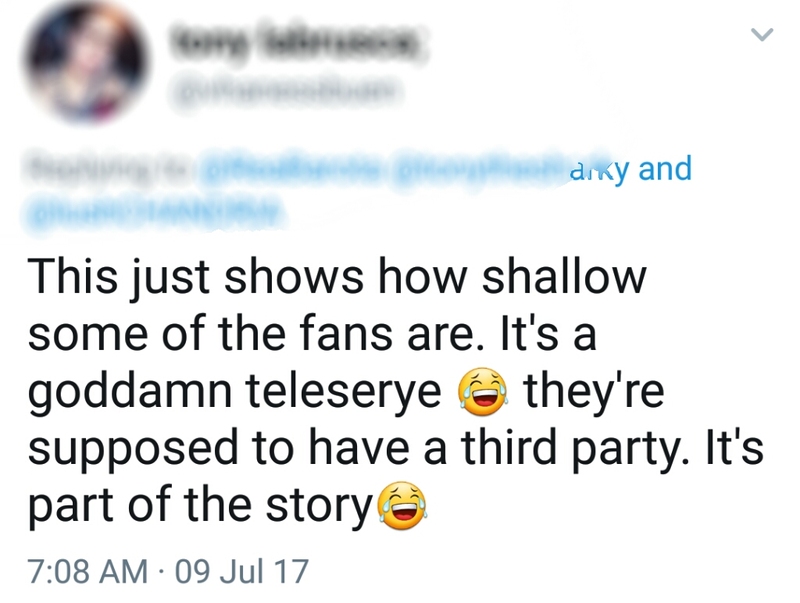 I wish the fans would be more understanding, and would avoid attacking whoever gets into a love triangle with Daniel and Kathryn. 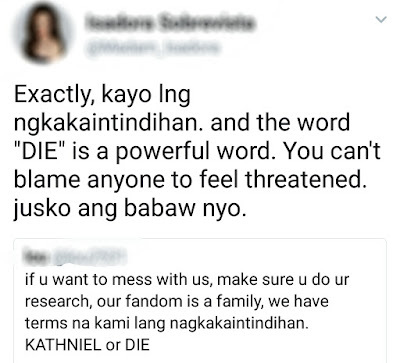 I think Sarah Carlos, Beabianca of Pangako Sa 'Yo, also went through like this before. 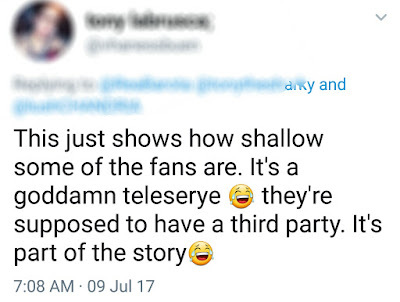 Tony, who is still new in the biz, perhaps would be more careful the next time (even though there's nothing wrong with that tweet), now that he knows how a simple tweet could result into a big trouble with those so-called possessive fans.